Mario Vergara, and more recently Alfredo Cremonesi. The Ambrosian liturgy for the funeral of a minister of the Church suggests that the priest has become similar to his Lord Jesus Christ; lived like him and, together with him, has gone through the passion, death, and resurrection. This close relationship between Fr. Piero Gheddo and the destiny of Christ became clear to me even yesterday, while I was meditating before his lifeless body. Fr. Gheddo’s coffin had been set in place and offered to the homage of all of us in the Chapel of the Martyrs at PIME: in the silence of that hallowed place, the coffin was surrounded by photos of the 19 martyrs of PIME, as if Fr. Gheddo was the twentieth. 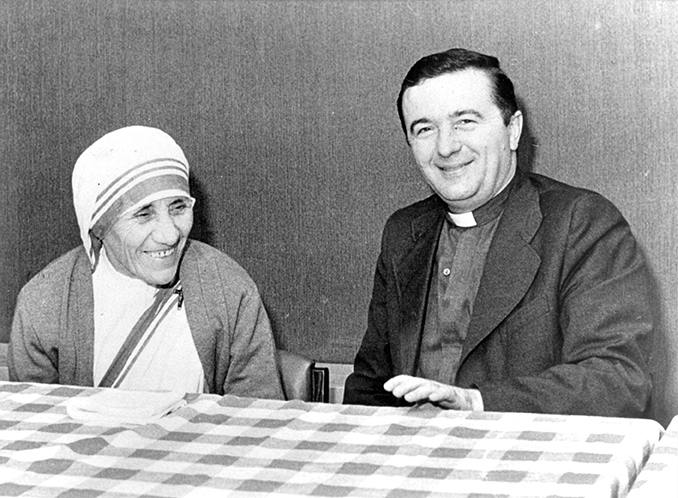 Although he was never given one, specific country to count as his mission-home; Fr. 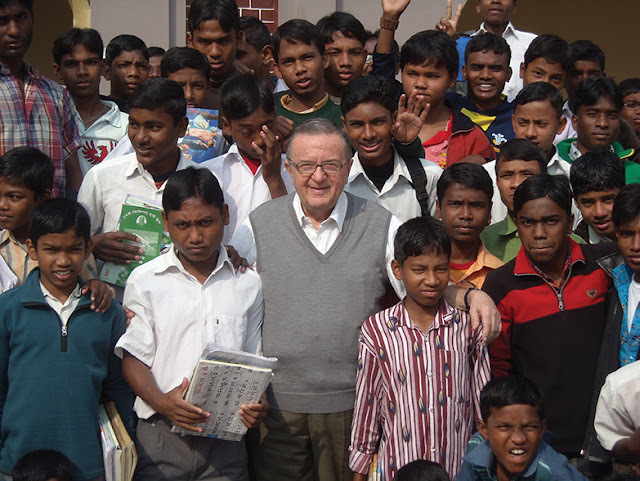 Piero traveled to missions all around the world to accrue his stories. There is almost a touch of irony in all this. In PIME, we often debate about the missionary identity of missionaries working in mission lands vis-à-vis those serving PIME in their homeland. True missionaries, they say, are those on the frontline; who risk their life amid countless hardships and possible persecution. Those who are at home are second-class missionaries: it is impossible for them to become martyrs. True, Fr. Gheddo toiled a lot to produce so much printed material and traveled quite extensively, but he has not suffered mortal wounds. Yet, if we take the term “martyr” in its original meaning, we can say that Fr. Gheddo was a martyr. Because “martyr” means, “witness”, “witness of Jesus Christ” and Fr. Gheddo witnessed Jesus Christ throughout his work, digging into words to bring out the beauty of the Word that is Jesus. To this endeavor he has dedicated all of his life, leaving no room for intellectualism and for a bourgeois spirit. 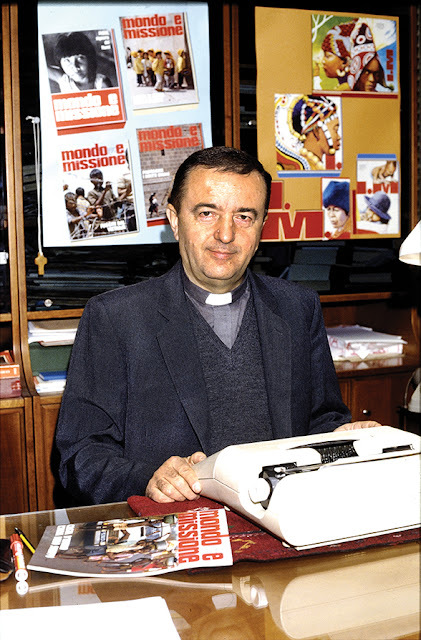 In addition to serving as the editor to Mondo e Missione for three and a half decades, Fr. Piero also founded mission news source AsiaNews in 1986. In the many discussions the two of us had together in the past, the meaning of being a journalist emerged, as defined by St. Maximilian Kolbe, a martyr at Auschwitz, but also a journalist in Japan. He said that the task of a Christian journalist is not to convert people, but to increase the esteem for Jesus Christ and for the Church in his readers. Fr. 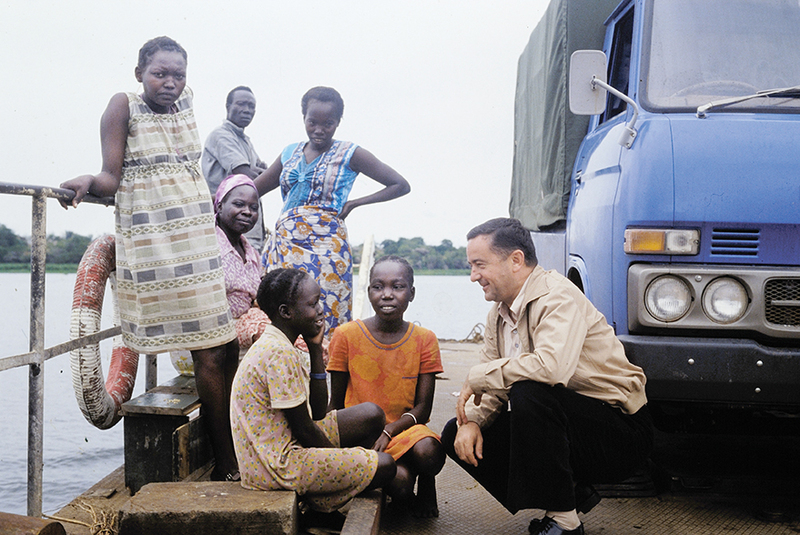 Piero lived for that purpose: in his writings, in his travel reports, the importance that faith in Jesus Christ had for the people about whom he was reporting. Along with their life struggles, tails with those details of how the Catholic Church was dressing their wounds, emerged. In his work he was a builder of bridges between the West and the East, between Church and Church. It is thanks to him that we have been able to know the Karimojon people of Uganda, their misery as victims of African wars, and the great commitment to humanitarian aid of the Catholic Church to them. It is because of Fr. Piero that we, in Italy, have discovered Mother Teresa, Helder Camara and many others (Beda Griffiths, Obando y Bravo, Cardinal Jaime Sin …), thus, learning about the deep scars of their peoples, the inhuman dictatorships, but also the cures offered by the Church. Yes, we can say that Fr. Gheddo was a “martyr” of communication because he witnessed Christ in his work and gave his whole life, every minute of it, serving the Catholic Church. Today we tend to serve the Church of our liking, the Church of one’s own group, of one’s own party, but not the Church as it is, the whole Church, the Bride of Christ. In fact, Fr. Gheddo served and worked with all the Popes, from Blessed Paul VI to St. John Paul II, to Benedict XVI, to Pope Francis. He worked and collaborated with all the archbishops of Milan: Giovanni Colombo, Carlo Maria Martini, Dionigi Tettamanzi, and Angelo Scola. Genuine witnessing is rooted in faith. Fr. Gheddo was a man of faith: a simple faith, exalted and moved in front of Jesus in the Blessed Sacrament. A faith learned first of all from his father and mother whom he himself identified as “holy parents;” a faith nurtured by daily recitation of the breviary and the rosary, recited walking with a brisk pace in the courtyard of the PIME Mission Center [in Milan]. He kept this simple, childlike faith to the end. to the efforts of Fr. Piero Gheddo. His great faith was matched by his outstanding charity. 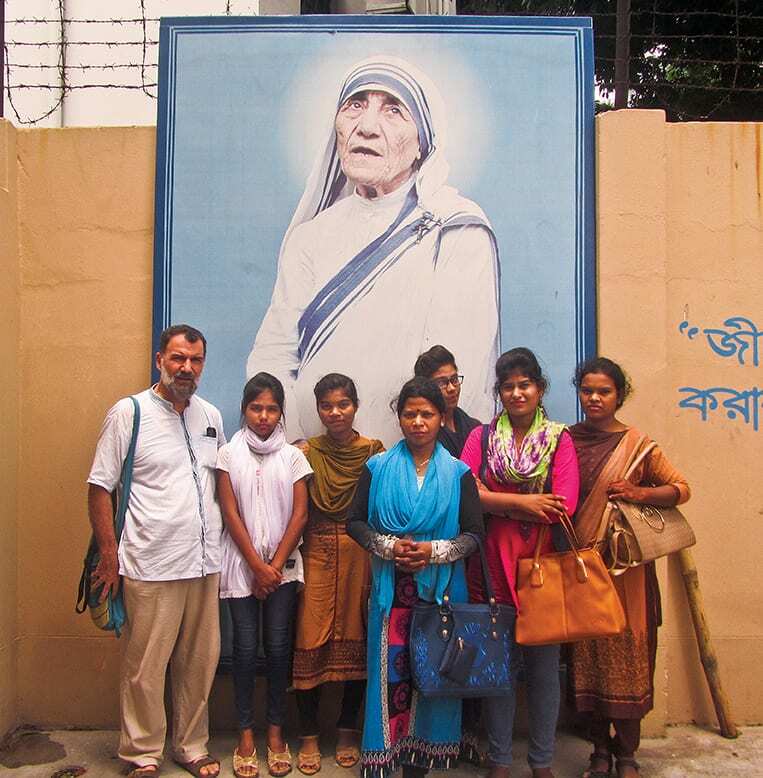 No one, be he a fellow missionary or someone else who sought help from Fr. Gheddo, ever left without having received the desired help. Also at the office he was cordial and attentive to the those around him and his co-workers: trouble finding a house for rent, the illness of a family member, the joy of a new baby being born into a family were shared events, giving the office not the atmosphere of a bureaucratic machine, but that of a real family. From the day of his death, the Superior General, the PIME Missionaries, the AsiaNews Agency and the Mondo and Missione offices have been flooded by messages from all over the world expressing gratitude for the help that Fr. Gheddo had given them. It is as if an underground network of relationships, of support, of life emerged. 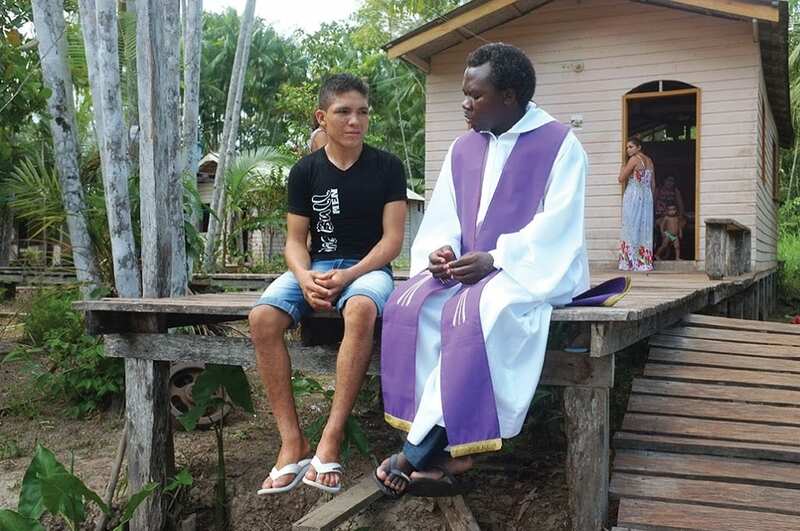 A priest from the diocese of Milan, now a missionary in Peru, was grateful for the help received to support his vocation; a newsagent near the [Milan] PIME Center thanked Fr. Gheddo for helping him take his first steps in his newly-found faith; a young graduate from the Bocconi University confessed of being supported in his work and to live it out as if it were a mission thanks to his friendship with Fr. Gheddo. Curiously, death seems to make room for life. While I was silent before Fr. Gheddo’s body, I was struck by seeing him clothed in a white chasuble, as if he were asleep, with the coffin covered with lace similar to those used in the cradles of babies a long, long time ago, perhaps in the nineteenth century. I remembered that in the Oriental icons of the Nativity, the Child Jesus is depicted in very tight swaddling clothes and lay in a cave, respectively reminiscent of the shroud of death and the sepulcher. It is a reminder of the link between birth and death, but also between death and resurrection and new life. I believe that today we are witnessing a death, but also a new outpouring of life.